Summer Garden Tour – Many Photos Within! With summer in full swing, and time to kill while I wait for my cheese curds to set up, I thought I would give my readers a virtual tour of my garden. We’ve only been here a year, and as it turns out I’ve set up the vegie garden right on top of the old driveway. It’s going to take a few years of adding manure to get the garden into full swing, but if there’s one thing we have plenty of around here, it’s manure. In the dry weather I get an accumulation of dessicated goat and poultry manure where the animals camp in front of the pens in the barn. As it turns out, this dried manure, which has been thoroughly scratched through by the poultry and contains much-trampled straw and lucerne leftovers, can hold a lot of moisture and readily re-hydrates. I shoveled up a trailer load the other day and used the duck muck (or goose juice) from the duck pond to rehydrate it. It held seven buckets of duck muck without much effort. I unloaded it on the next garden bed to be planted out, and put a couple of shovels full around the roots of the fruit trees. Duck muck (or is that goose juice?). Duck muck plus dessicated manure. Makes an excellent growing medium. This dessicated manure plus duck muck concoction is loaded with nutrients, and holds water like a sponge. On a hot day the top layer will dry out, but it remains damp underneath, keeping the roots of the plants cool. I’ll be collecting up a bit more of this over the summer months. The new greenhouse is going really well, with tomatoes, capsicum, corn and chickpeas growing. I’ve also got some watermelons in there, and I am very excited to have my first melon growing! I’ve got some varieties of capsicum and tomato that I haven’t tried before, so it will be interesting to see how these go. Hopefully I’ll get a good yield of both and be able to put away lots of jars of salsa for the winter. 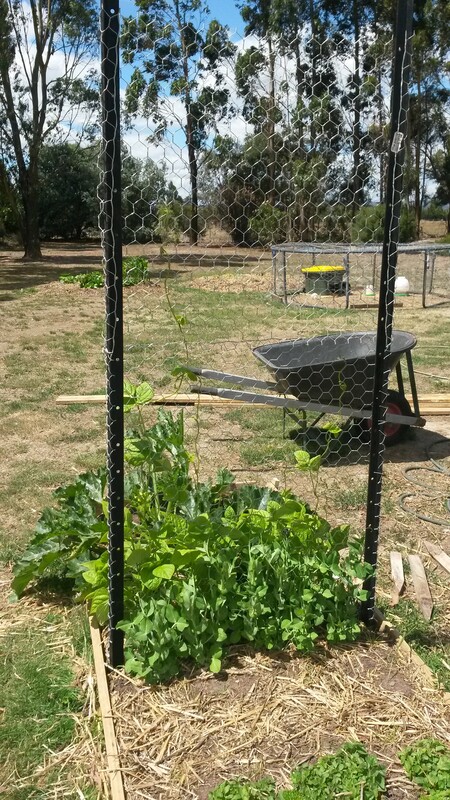 I’ve had a lot of trouble with birds getting into the fruit and pulling up seedlings, so I’ve had to resort to netting a few parts of the garden. The climbing frame sat waiting for a job to do for ages, before I added netting to it and made a magpie-proof seedling frame. I’ve added a couple of slug traps to my bag of tricks, and finally I’ve got lettuce surviving long enough to be edible. I’ve got celery and some tomatoes that I don’t remember planting under the dome as well. Elsewhere I have outdoor corn and chickpeas, five zucchini plants (will I ever learn, two would have been plenty), QLD Blue and butternut pumpkins and snow peas. I’ve just planted some lettuce from a variety I really like that I saved seeds from, a few miscellaneous free herb seeds from Diggers and some climbing peas that I saved from a previous crop. The strawberries in the centre are growing like mad, and trying to put out runners all over the place. I’ve had to net these to stop the blackbirds from taking all the fruit, but I still find plenty of half-mauled ones which the residents of the SilkieDome are happy to finish off. Strawberries, lavender and a lemon tree. My blueberries are still alive (touch wood!) and have a few fruit. They have also been netted. I know you aren’t meant to let them fruit for the first couple of seasons, but my blueberry bushes don’t tend to live long enough to get to a second season, so I figured a few berries wouldn’t be a matter of life and death. Blueberries – not dead yet. I’m very reluctant to leave citrus trees to the elements, after losing all my half-grown lemons to a -5.7* frost last winter. I have espaliered my new orange and lime trees, which gives them support and allows me to keep them on the north wall of the porch. The orange blossom smelled just divine in the spring, and now I have tiny oranges growing. I’m hoping the lime tree will happily yield too. Espaliered trees on the north verandah. And finally, my fig tree is having a great time and looks like it is actually starting to fruit. I love figs, and you can’t get them at the shops, so I am really looking forward to eating these. Happy fig tree, now with leaves. So that’s the garden update for Summer. The forecast is for warm and wet over the next few months, so hopefully that bodes well for big yields. When people ask me for advice on growing vegetables, my first point is always start small and try a few different things. Preferably things you would happily eat. Then learn from your experience and expand as you go. A vegetable garden can come out of nowhere, and the best way to learn is to experiment. I see many proud beginner gardeners with packets of seeds or punnets of seedlings planted in neat rows. Often these uniform seedlings, planted side-by-side, have completely different growing patterns. Rosemary and parsley might start out the same size when you buy them and plant them in your new herb garden, but that rosemary is going to turn into a great big shrub and drown out your parsley. The climate requirements of different plants are not always compatible either. I always grimace when I see basil and tomato seedlings for sale in chain stores as early as August. These are started in climate-controlled greenhouses. When you plant them in your chilly Ballarat garden they are not going to last long. Over the years you learn which plants will naturalise, which will die off in the first frost, which will just refuse to grow in certain soils and which are pretty much unkillable. Eventually you will figure out how to grow the plants you like best. Sometimes you will stumble upon something that completely revolutionises your garden. For me, that something is SilkieDome. 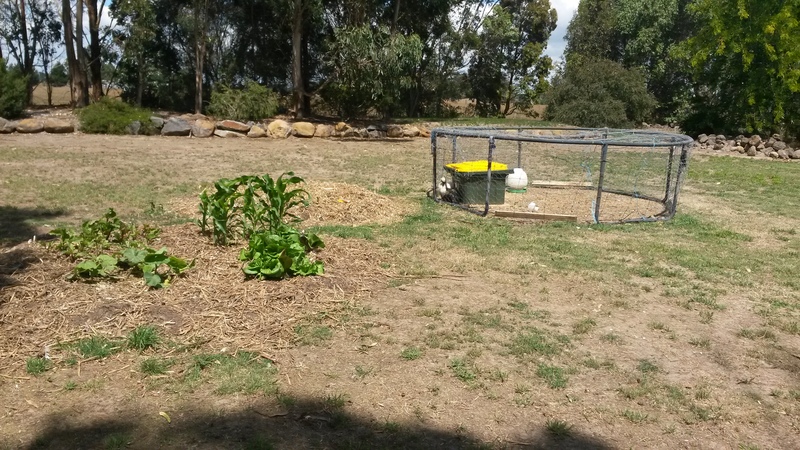 I was introduced to the concept of the integrated garden and poultry system during a site visit as part of the Introduction to Permaculture weekend I attended last year. This impressive mandala garden had a pond in the middle and a series of circular garden beds around it. Atop one of these garden beds was a round poultry tractor, whose residents were cheerfully digging up the spent garden plants and fertilising the bed as they went. So when setting up the food garden at the new house, I was determined to try this method of gardening. I had hung on to the kids’ old trampoline frame for two years with the intent of doing something useful with it. Finally it has become SilkieDome. 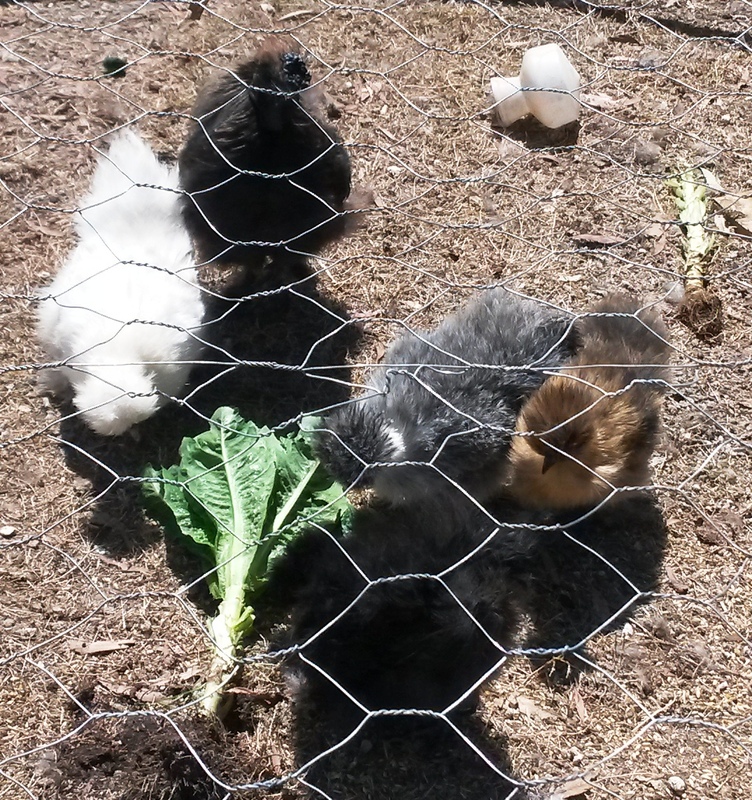 I considered Silkies as ideal residents for the garden. They are small, quiet and don’t need a great deal of space. And my Silkie rooster, Malcolm, has been more than happy to move away from the main farmyard where he had to compete with the big Rhode Island Red rooster, Russell Crow. The Silkie family is made up of my white hen Quartz, Malcolm the black rooster, and three of their daughters who hatched in November. As for the garden itself, we are on to the third bed. The mandala garden in progress. Now, the real beauty of this system is that it encourages staggered plantings and maintaining season-suitable growth of different vegetables. When you have square, stationery beds, you tend to (or at least, I tend to) plant one block of something and that is it for the season. You grow it, you harvest it, you eat it, and that is it. But with the need to regularly move onto the next bed, you can add a late planting of a warm weather favourite, or put in some plants to harvest in Autumn. With each move of the SilkieDome there is an opportunity to try something new, or have another go with something that has already worked. I have plans to put a gravel path between the beds, and in the centre plant something decorative that will attract bees and other beneficial insects to the area. Each bed is grazed out by the Silkies before I put down a load of garden mix and top it with straw from the main poultry night pen. Since I am basically starting out on what was once a driveway, the garden mix (a combination of mushroom compost, manure and topsoil) will give each bed a head start and allow the plants, and later the Silkies, to make inroads into improving the soil underneath. The thick layer of straw mulch with poultry manure keeps the moisture in the bed, at the roots of the plants where it is needed most. I have static garden beds, as well as the dynamic ones. I plan to put an area for blueberries behind the greenhouse to take advantage of the afternoon shade. The front boundary of the garden will eventually be filled with rows of berry canes. There is a bed that I put in next to the greenhouse to get me started which will be used for self-seeders and perennials, as well as climbing peas and beans on the climbing frame. Static bed with climbing frame. The greenhouse has been so successful for growing tomatoes and capsicums that I don’t think I will bother trying to grow them outside in future. 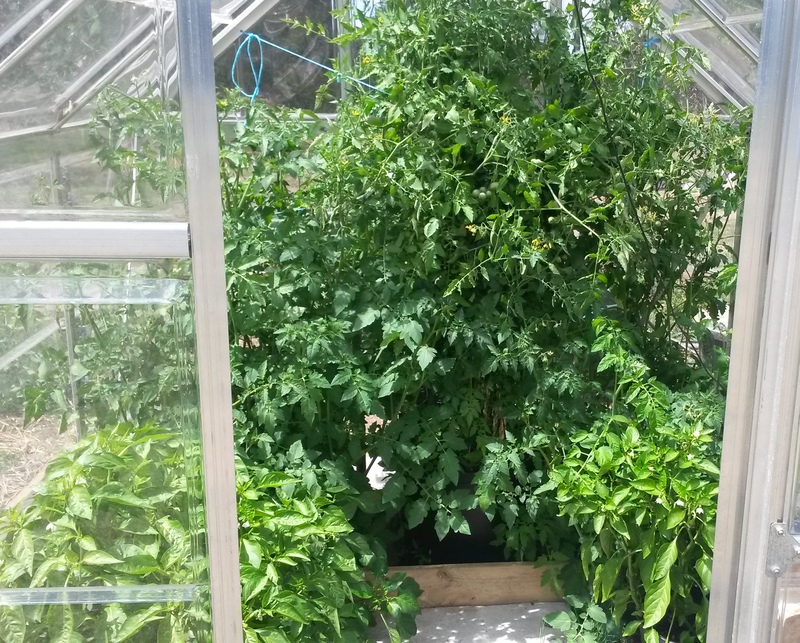 Tomatoes and capsicums growing like crazy in the greenhouse. It will be interesting to see how the SilkieDome project pans out, and how the winter plantings will go. Will the rotations work out well for the Silkies and the plants? Will I be able to grow anything actually edible through winter? 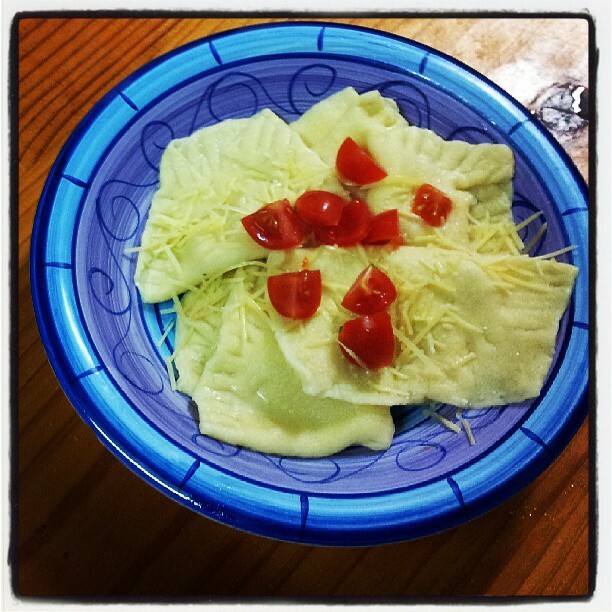 It is all about experimenting, trying different things, figuring out what works and growing more of what we like to eat. Just like when I first started out.